Was looking through the files (read: images that somehow never seem to get deleted from the camera disk) and came across this one shot from my office window. 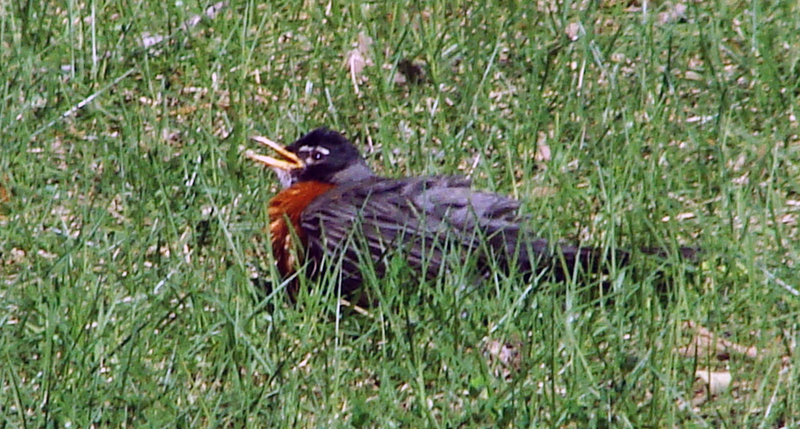 It was a very hot June day, and this robin, like everyone else on very hot days, seemed rather irritable. He walked to and fro, ranting as he went. 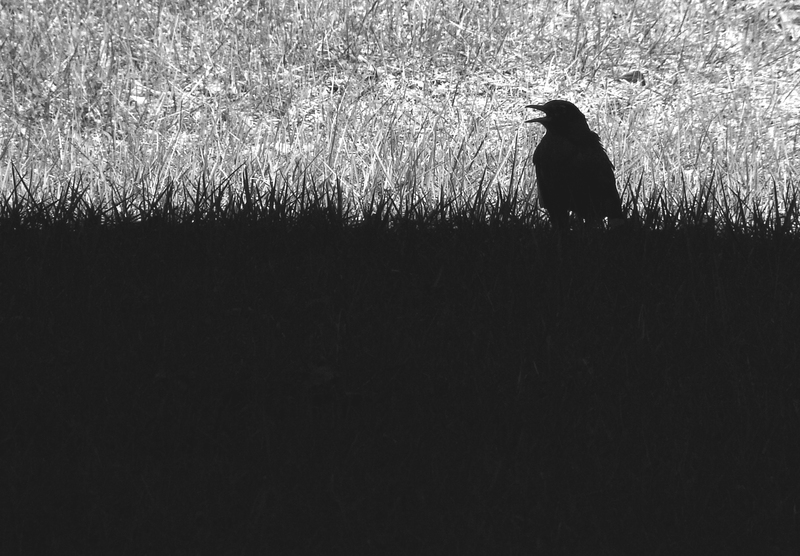 He finally ran out of steam and sat in the grass, panting and with his feathers fluffed to vent heat. In the top shot, he sat at the edge of the building’s shadow; the other shot is what he looks like in all his glorious grouchy color. Robin is a little edgy on a hot June day. 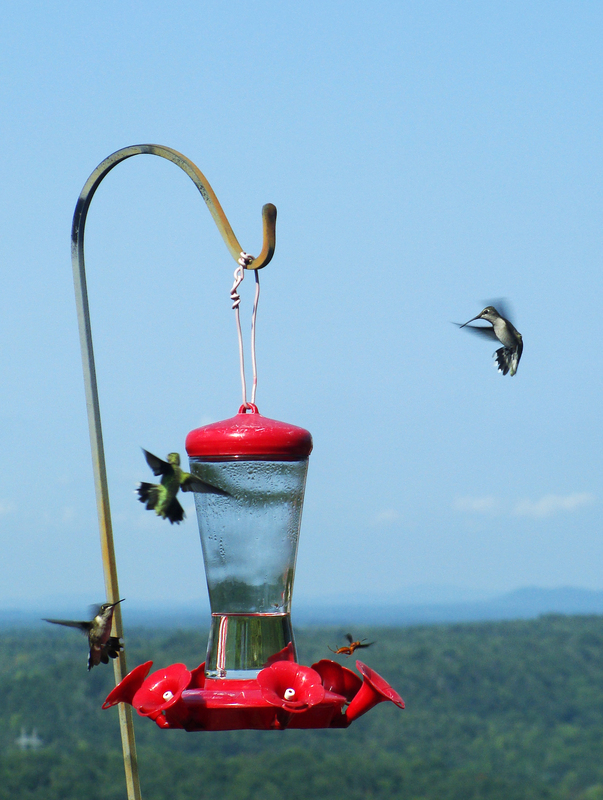 Anyone who has a hummingbird feeder is familiar with the rigidly enforced pecking order of the birds who feed, or try to feed, there. This morning it was somewhat was amusing (OK, satisfying) to see the boss bird being chased and herded away from the sweet nectar by a red wasp and another tiny black flying insect. SHOO! Red wasp ‘owns’ the feeder despite the efforts of a trio of hummingbirds. 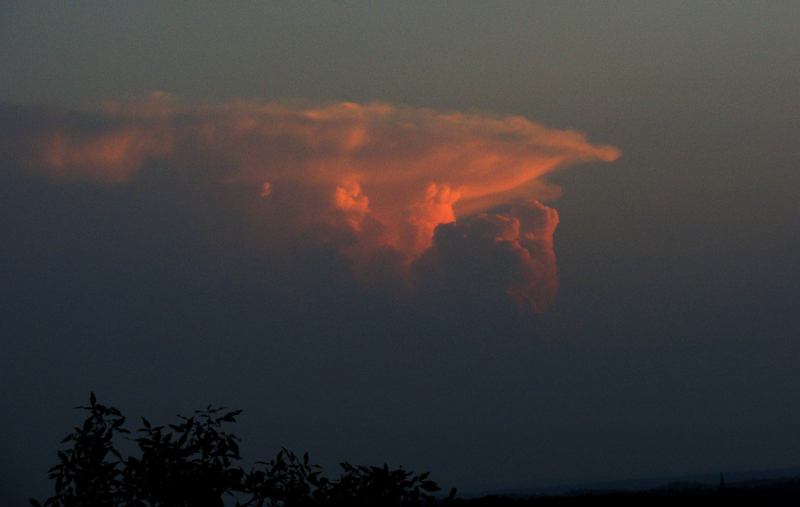 This evening’s setting sun painted the thunderhead gorgeous colors. 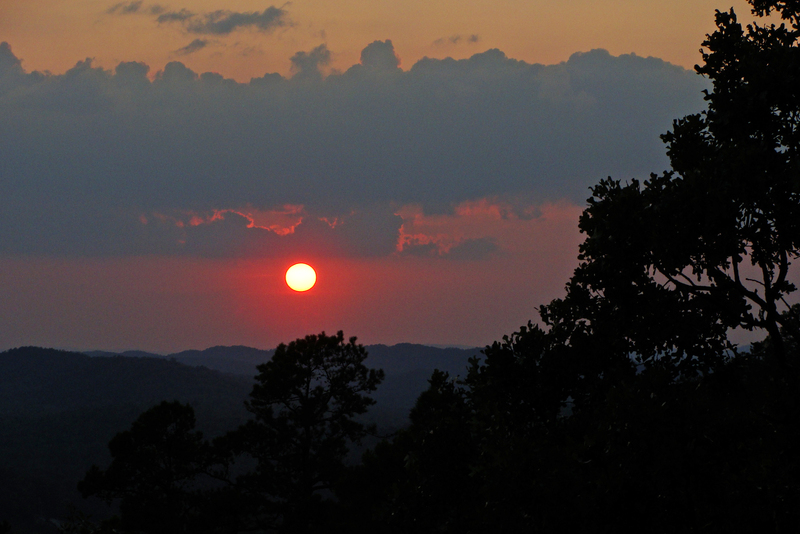 According to the radar, this storm was about 100 miles to the SW.
Late summer color on the mountain. Been a very beetle-intensive morning. Here’s a look at a simple change of focal point to go along with this week’s challenge. This little scarab was on a roll this morning, speeding this just-under-golfball-sized ball o’ deer poop (from the pig Latin ooppay) across the road. His treasure safely on the south side of the road, he burrowed into the leaf litter. GO BABY GO — Beetle races across the road with his fresh deer dung. SPEED BALL — This beetle was rolling his one-inch ball along at about a foot per second. SAFE — Beetle brings his prize safely across the street. 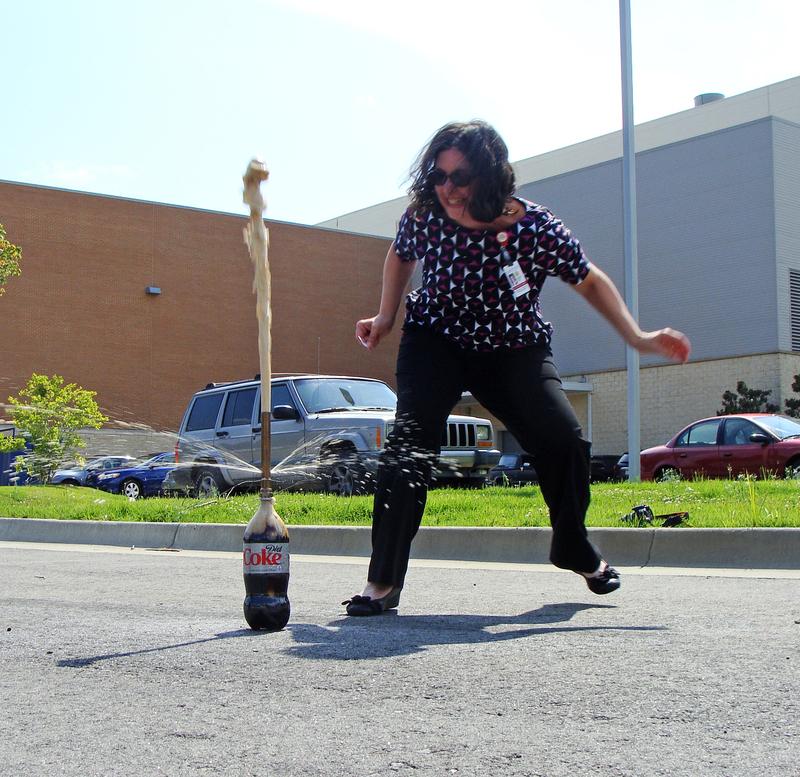 It was a long, hard week at work and when I got the invitation to join folks from another department in a little Friday afternoon folly involving Mentos and Diet Coke, naturally, I grabbed a camera. An offbeat way to end the day — by blowing off some carbon dioxide. 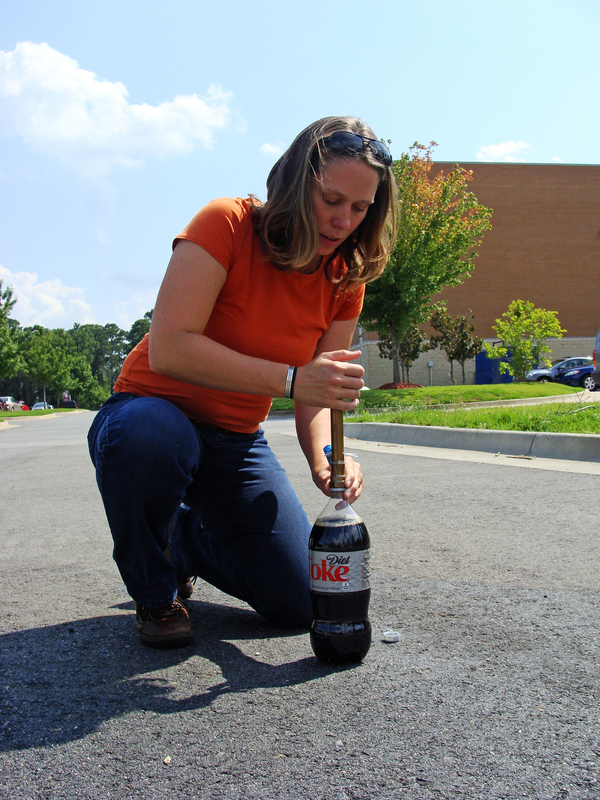 LOADING — Aly fitted a copper tube onto the top of the soda bottle. The tube had two holes drilled into it and a piece of paper, rolled up tightly like a lollipop stick, was threaded through the holes to serve as a trigger. Mentos were dropped into the pipe from the top and would come to rest on the rolled up paper. Pulling the paper out would drop the mints into the soda. A split second after Kristin pulls the trigger and beats a hasty retreat, the geyser surges upward. After weeks of rain and cloud cover that denied us a chance to see the Perseids this year we had a run of clear days and nights, giving August’s blue moon a chance to shine. Ran out on the deck before work to capture it. As I clicked off frame after frame, the local hummingbirds swirled around in their usual aerial battles. One of them managed a little photobombing. 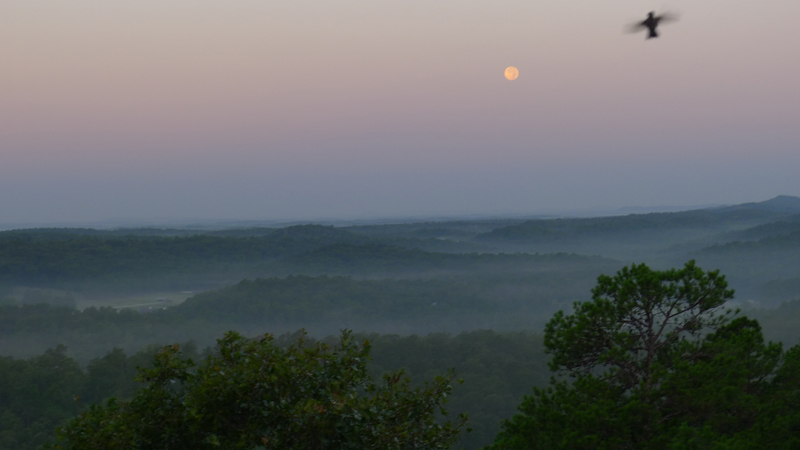 Blue moon setting over the misty Ouachitas. 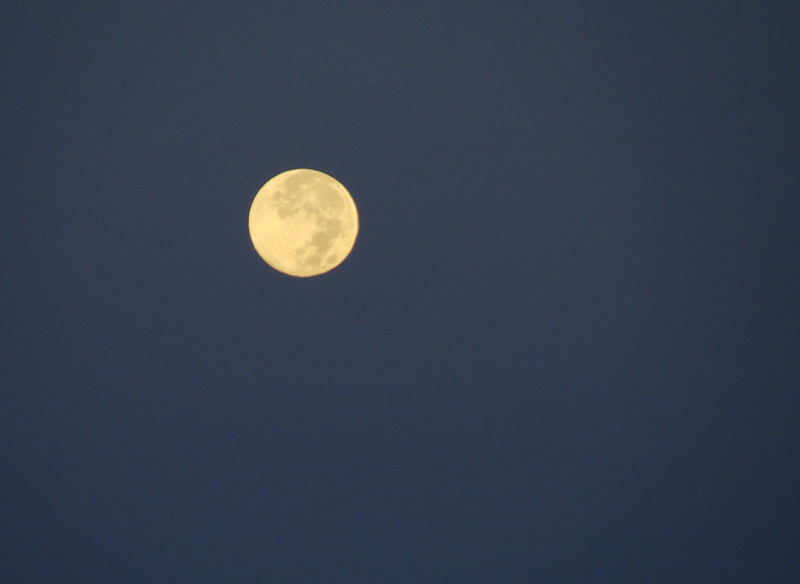 Tighter shot of our August blue moon. 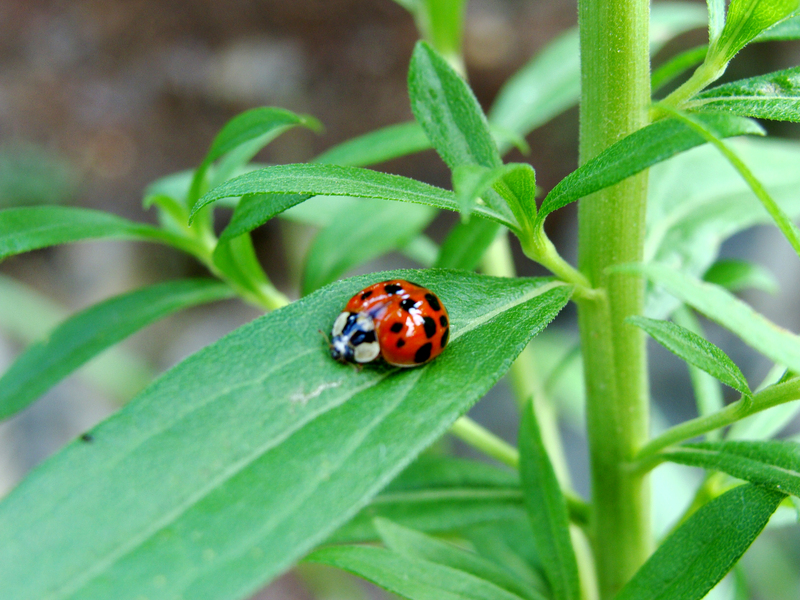 A second entry into this week’s photo challenge. Weekly Photo Challenge: Carefree (Den Haag) | What’s (in) the picture?